Caption slip reads: "Photographer: Snow. Date: 1958-07-25. Reporter: Donoghue. 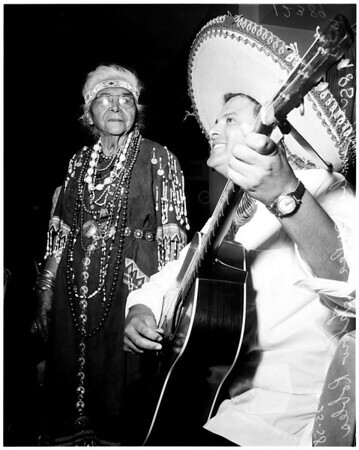 Assignment: 109-year-old Indian woman's birthday party.Tatzumbie Du Pea, America's older Indian woman, is serenaded at 109th birthday party in Los Angeles Press Club, by Lalow Robles, Olvera street troubador".